Import your contacts into the SendOutCards Relationship Manager system in a few easy steps! 2. Click the three dot options icon located in the upper right side of the screen. 3. Click the Import Contacts option in the upper left corner. 4. 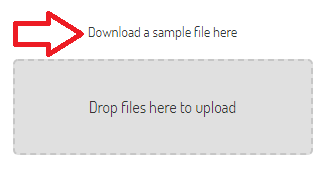 Drag and drop the file you wish to import into the grey box displayed on the import page. 5. Once you select the supported file to import, the system will preview your data. This will allow you to match your column headers with the SendOutCards Relationship Manager fields. Once you have matched all of the fields needed, scroll down and click the next button. -Once the system has scanned your file, the system will display all the contacts in your file. If all the contacts in your file are complete, the system will show all the contacts ready to import. You can use the checkboxes to select the contacts you wish to import. Once the contacts are all selected, click Import. -If the system determines you have contacts missing required fields. The invalid contacts will be displayed above the complete contacts. The missing required fields will be shaded pink. You may click on the shaded fields to add the missing data into the required fields. Once the data is entered and saved, the contact will be moved to the ready to import list. If you choose not to add data to the required fields, the incomplete contacts will not import with the rest of the file. Once you have edited all the incomplete contacts, click Import. 6.Once your contacts are uploaded, a confirmation screen will appear.